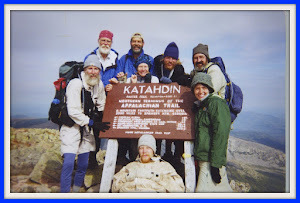 A reader told me not long ago that she liked my essay, "Night Moves", about sleeping on the Appalachian Trail that follows Chapter 2 in At the Speed of Foot. After reading how I coped with the alternating states of consciousness and unconsciousness most nights, she found herself able to relax more completely during nights of intermittent sleep. I thought that was pretty cool, that something I wrote actually helped someone. I'm happy to just to know people read my book. To think that it made even some small difference is very gratifying. With that introduction, I give you "Night Moves". Sleeping on the trail is as much a matter of attitude as it is a reality. Maybe more so. I sleep intermittently most nights, waking every few hours. Finding a comfortable position on my 48" sleeping pad and moving about in a sleeping bag usually requires conscious effort. Each time I move I deliberately re-arrange my body to a position that I can hold for my next hoped-for stretch of unconsciousness. But holding any position for long is impossible. Only sleeping on one side or the other really works for any amount of time but even this only lasts for a while and I must change position. Lying flat on my back avoids the leg stress but sooner or later I am compelled to roll over to one side or the other, which then creates the soreness that forces yet another move. All this activity and semi-conscious calculation meant that I slept fitfully many nights. Nonetheless, I was sufficiently rested to walk 10 to 20 miles most days. That’s where attitude came in. Rather than worry about lying awake and missing sleep, I redefined my night time experience as rest. If I wasn’t asleep, at least I was not walking, not carrying a load and able to recognize the time in my sleeping bag as a respite from the day’s hard work. “Going horizontal” I called it. After a few weeks on the trail I knew that simply relaxing my body totally would provide sufficient rest to get me to the next camp. Successfully adjusting my attitude required that I fill my mind with soothing thoughts to keep from worrying about not sleeping and the many other demons that waited to haunt me in weak moments–small injuries, business affairs, finances and the like. My favorite mantra, especially later in the hike, was to list all the shelters where I had stayed along the way. I remembered the bus routes of my childhood, my long list of Grand Canyon hikes, anything that would pleasantly occupy my mind until I drifted into unconsciousness. It worked most nights. Cool weather was best for sleeping; I could bundle up in my sleeping bag. Hot weather was not good at all, especially in the humidity from late May through August. Luckily, those months had the shortest nights. Darkness did not completely fall until 9:00 p.m. in the summer and dawn broke around 5:00 a.m. Even with the extra daylight, I would still be horizontal by 8:00 or so, especially if I had a sufficiently early camp. If the weather was dry I could roll up my tent fly so that I would have maximum ventilation but on wet, humid nights, my tent could be stifling. Sleep was difficult those nights. However sporadic my sleep, I welcomed the relief from the day’s chores. I crawled into my tent every night glad that I would not be walking for the next eight or so hours, happy for the chance just to lie still (relatively speaking) for a while. I slept much better in my tent than I did in shelters. The ground was always softer than the wood floor of the shelter. My tent was a private room, a place where I was all by myself. The solitude relaxed me; I did not have to worry about disturbing other hikers during the night. I could get up to pee, make all the adjustments I needed to stay comfortable and spare shelter companions my abrupt spasms during sleep. Those spasms sometimes caused my feet to slam the shelter floor which resonated like a kettle drum. I never woke up screaming from a nightmare in a shelter but always worried that I might. I once unnerved a hiking partner doing that. If I snored (very likely if I fell asleep on my back and a good reason not to), no one would be close enough to be bothered. Sleeping in a tent was always preferable to a shelter unless it was raining. Hours sleeping–or at least, being horizontal–were rivaled in number only by the hours walking. I had not thought too much about sleep in preparing for my hike other than to make that time as comfortable as possible with an inflatable pad, good sleeping bag and tent. As the miles passed I soon recognized the delicate balance between the two activities. Walking carried me toward my goal. Sleep allowed me to rest up for each day’s effort. The sleeping gear that weighed down on me during the day gave me comfort during the night. And my ability to relax in varying states of consciousness throughout the night gave me the energy to get up and walk again the following day.